If you’ve been studying at Oxford House for a while there’s a good chance that you’ll recognise Judy – with her big smile and bubbly personality. She started working with us in 2012 after completing her Trinity Cert. TESOL. Since then she’s taught hundreds of students, helped develop OHConnect – our online platform for students and gone on to take a Diploma in teaching English. A year ago she took over as Director of Studies (DoS) and has loved (almost) every second of it. Her mission is to make sure that everything runs smoothly, students are happy with the classes and their progress and the teachers have everything they need. 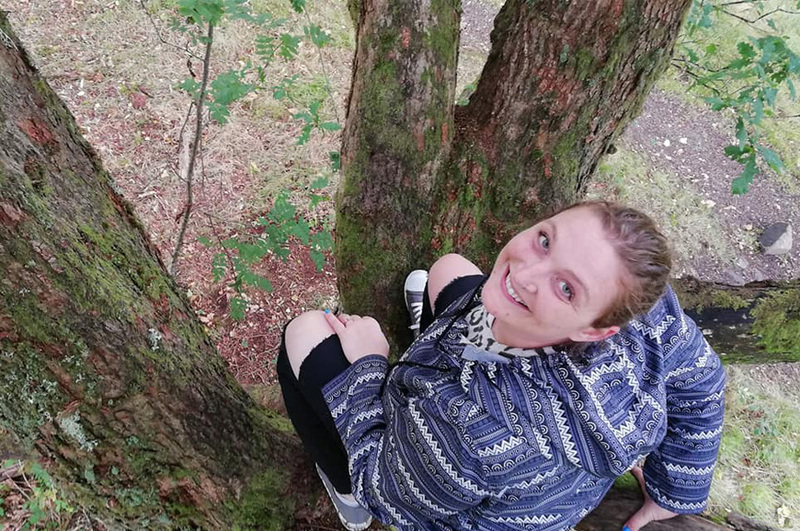 We managed to catch her for five minutes between interviewing teachers and organising schedules to find out more about her experience as DoS, what she’s looking forward to most this year, her top tips for students who are about to start a course and much much more! You are just starting your second year as DoS at Oxford House. What were some of the highlights from year one? Definitely being a part of the team organising Innovate ELT 2018. 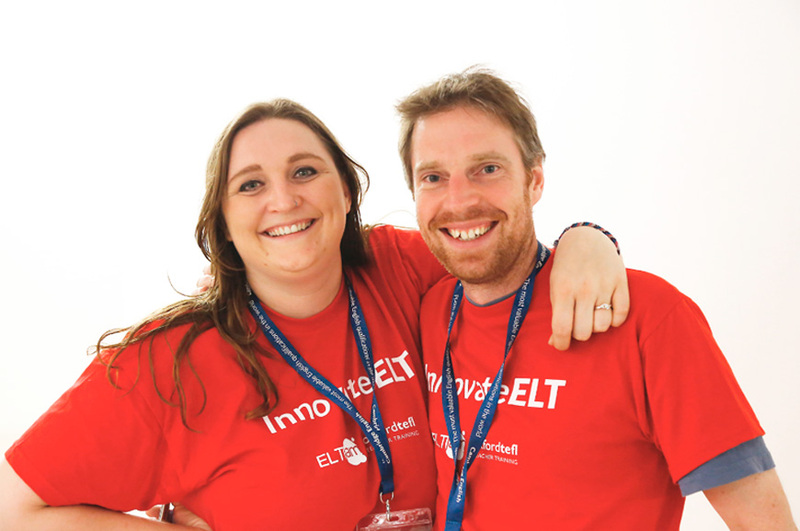 For those that don’t know – Innovate ELT is an annual conference held at Oxford House every May. There are workshops, live classes with some of our own students, outdoor plenaries, panel discussions and lots of other fun activities. Although it was an incredible amount of work – it was super rewarding to be part of something like that. It was so nice to see teachers, learners and experts from all over the world get together and share their ideas and have a vermut or two in our lovely garden. Another highlight was the end of year party. I got lots of messages from teachers thanking me for all my hard work over the last year – which meant a lot. Did you face any major challenges? How did you overcome them? Probably the thing holding me back most when I started as DoS was my Spanish! I didn’t have a very good level and the idea of speaking to students on the phone was terrifying. However, I’ve been doing classes twice a week for the past year and working in a Spanish speaking environment in the office has given me a lot more confidence. Now I take any opportunity to speak to students. It’s also nice to be able to share my experiences as I know what it’s like to learn a new language and how tough it can be. When you are not at Oxford House, what kind of things do you like to do? I’m a self confessed nerd so when I’m not at work then I’ll usually be gaming, reading, or doing puzzles. I also love cooking, especially for others. There’s usually one or two friends over for dinner every night! My signature dish is probably a Sunday roast. How do you support the students at Oxford House? I tend to walk around the school, chatting to students as much as possible. Learning a language can be a very daunting experience and if I can make someone’s learning journey more comfortable and enjoyable then I’m here to help. As I do a lot of level testing for new students, I get to know a lot of faces, and people are always happy to chat. We also do class observations each term and I take this opportunity to speak to students in a group about what they enjoy about their course and how we can improve the experience even more. My door is always open – so if you ever want to chat about your classes, your progress or anything to do with learning English – don’t be afraid to ask. And how can students get in touch with you if they want to talk or have any comments or feedback about the school? As I said, I have an open door policy for both students and teachers. You can ask for me at reception – I’m usually available from 10h00 – 18h00 Monday to Friday or you can send me an email if you prefer and we can arrange a time to meet. You can reach me on judy@oxfordhousebcn.com. How do you support the teachers? Similar to with students I try to always be around for the teachers. As I was part of the teaching team for five years before I became DoS, I built up good relationships with the rest of the staff and I know first-hand the issues they face and the type of things they need help with. We take professional development seriously. As well as the observations – we run training workshops, encourage teachers to attend seminars and conferences outside of the school and take further qualifications like the Trinity Dip TESOL or Leadership in ELT course. We also train our teachers to become level testers and speaking examiners for our mock exams, have a teacher representative and offer opportunities to get involved with the admin side of things. What are your top three tips for anyone who’s just about to start an English course? The best things you can do is get stuck in! Try and start using English everywhere you can rather than just coming to class every week. Watch TV and films in English with English subtitles. Change your phone language into English. 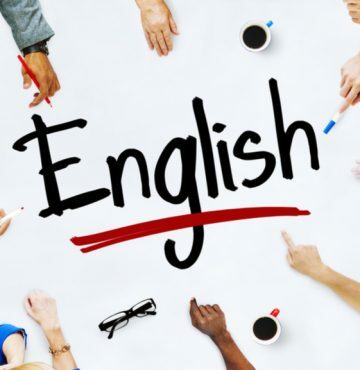 There are so many things you can do make English a part of your life. For more ideas read our post: 6 Language Hacks to Learn English Faster. Can we expect any big changes around the school? Based on your feedback we are constantly improving our courses and facilities. This year for example we are looking at providing you with more resources on oh connect. We’ve added some new timetables including Friday mornings, teens on Saturdays and super intensives during the summer. We are also adding more social events to the calendar so you can practice your English outside of the classroom. As well as Chatty Thursday and Happy Friday, we are starting yoga in English, a book club, and encouraging more language exchanges between our English and Spanish students. We also organise a ski trip to Andorra every year. What else are you looking forward to this year? This year we’re preparing for accreditation by EAQUALS – an organisation that ensures the schools in their network provide students with excellent language education. It’s going to be a lot of work but we are really excited to finally be accredited for all the hard work the teachers and admin staff put in year round to make sure we offer you the best possible service. Thanks for speaking to us Judy! Did you enjoy this interview? If so, read our post: Oxford House Community: Meet Our Students. Plenary (n): an opening or closing session at a conference where everyone attends. Tough (adj): difficult or hard. Signature dish (n): a meal that someone cooks often and usually well. Sunday Roast (n): a classic dish from UK. Tend to (v): frequently behave in a particular way or have a certain characteristic. Daunting (adj): something intimidating or difficult to deal with. Open door policy (np): you are free to speak to someone whenever you’d like. Build up (pv): a gradual accumulation or increase. Staff (n): the people employed by a company or organisation. Get stuck in (exp): start doing something with enthusiasm.